A s I have mentioned before and consistent with my general belief in the virtues of rectitude and propriety, I place high priority on respecting the specialty of a restaurant. If the name of the restaurant includes a word like “taco” or “pizza”, then I know what I ought to order. The contrapositive of this fact is that I have avoided sullying my cincuenta taquerías project with reports of places that are not in fact taco shops. 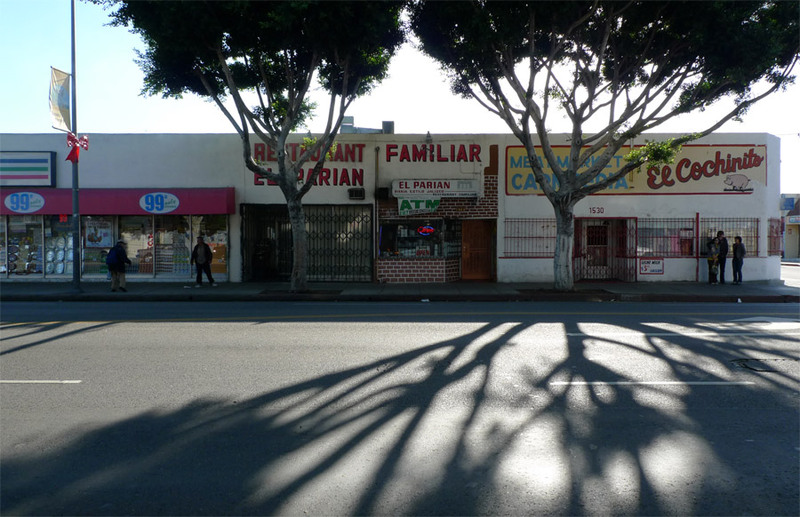 But I have made an exception for El Parian, the sign over the door of which says “Birria Estilo Jalisco, Restaurant Familiar,” because of its significance in the tacoscape – to wit, El Parian’s role in the evolving taco-informationscape of the 21st Century. Five years later in 2005, in the bright early days of taco blogging, the pioneering taco blogger Bandini wrote in the Great Taco Hunt of visiting El Parian and, in another wonderfully unambiguous statement: “simply put this is the best carne asada in the history of mankind.” Bandini threw down the gauntlet, reclaiming for a frequently birria-nervous audience of interweb-reading gringos the carne asada that Gold had so contemptuously dismissed. 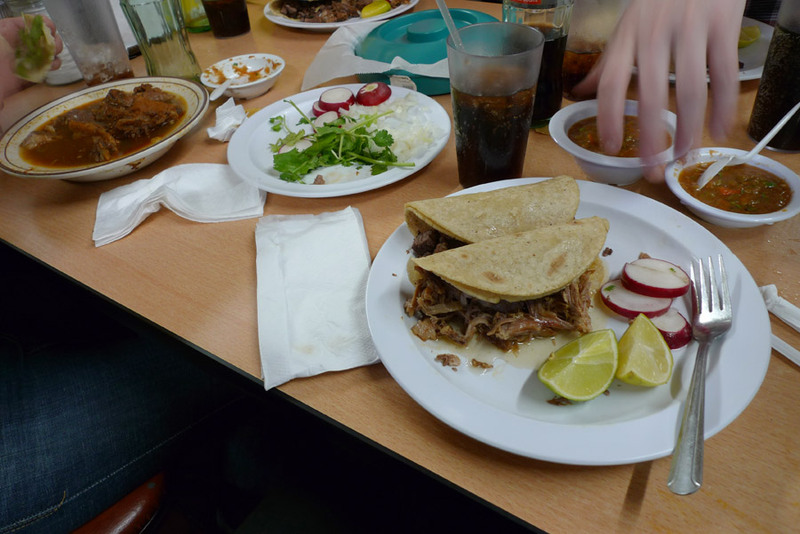 And now Gold has himself taken notice – Gold’s reports about El Parian in recent years acknowledge both the taco blogosphere’s influence on the place and the fact that the carne asada truly is delicious. Carmen and I met Russ, Shanta and Damien here for lunch on this beautiful afternoon. From the sidewalk all you see is the dingy façade and a half-dozen busy cooks in the front prep area, but passing through the heavy screen door reveals a surprisingly vast and airy, high-ceilinged space, unpretentiously spare with something of the communal feel of an open-air beer garden or a cafeteria. We sat towards the back between a row of arches that seem to be actually holding up the roof, and a row of store-style glass refrigerator doors where the beers and Mexican sodas are stored. Russ, Damien and I ordered tacos – I chose the carnitas and carne asada, $2.99 each but big enough to be worth it. Carmen hewed to the path of righteousness and and took an order of the birria. We waited quite a while for the food, but crowded in our corner of this spacious-feeling, cold, noisy and smelly dining room felt to me like the right place to be hanging out. My two big tacos came in unorthodox fashion – rather than tortillas flat with a heap of meat atop, the tortillas were already folded over to encompass the heap of meat filling. The heavy, thick, doubled handmade tortillas were quite corn-tasty and structurally adequate for the job. I ate the carnitas first, dismayed by the puddle of carnitas-water forming on the plate around this taco, but the carnitas itself is very good. Moist and flavorful, but far from crispy and with a fairly uniform texture, it possesses the deep pork-alchemical flavor magic of serious earthy carnitas. The thick handful of taco offers many big satisfying bites for the pork lover. And the thick tortillas withstood the moisture to the end. The carne asada taco could do nothing other than disappoint, as expectations had been so ramped up by the hype. Rather than the “thick strips” that Bandini described five years ago, I found cuboid chunks. The steak was great, don’t get me wrong. It was seasoned sparely and effectively, with visible specks of black pepper. The steak had the fatty taste of marbled skirt steak. The charry, full-bodied steakiness of the cuboid chunks gives it the satisfying “I just ate real steak” impression that you get when you eat a named cut at an American-style steakhouse, as opposed to the anemic feel that finely cut taco carne asada often exhibits. The experience was marred by a few scattered tough bits. This was a great taco that I would gladly eat again, but there have been several steak tacos that I have enjoyed more during this year’s rewarding taco-eating journey. I sampled the birria too. So flavorful and good, but so goaty and empalagating. Your clothes will smell like El Parian afterwards and you may prefer that they did not. But I think it’s worth it – I found El Parian charming.